I'm pretty handy with a wrench but this one made a monkey out of me - thought I'd share. I bought a NH TC33D new in 2002 to maintain our 1 mile gravel road - raking in the summer, snow blowing in the winter. Only racked up 1300 hours so far. Summer before last had occasional problem starting - turn the key - clunk then nothing. Keep trying it will eventually catch. Figured classic symptom of burned contact in starter solenoid although it seemed a little odd that it only happened on the hottest days which is 95 degrees here in Michigan. Also seemed like an early failure. Bought a new solenoid but didn't get around to changing it until this summer when problem returned. All changed and clunk - nothing again. Didn't think it was the battery even though it's 8 years old. 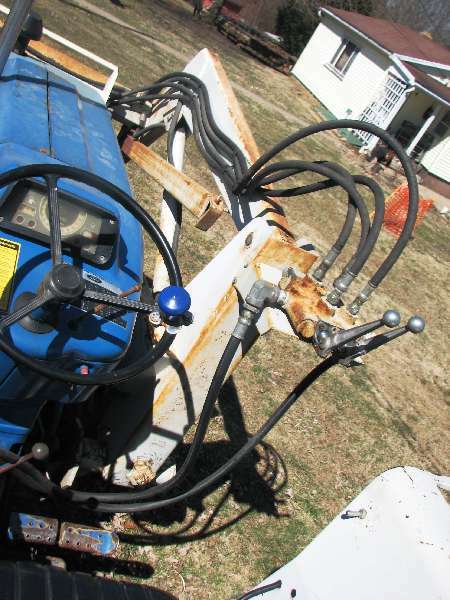 It cranks strong and I use the tractor for jumping my old junk plow truck all the time. Cleaned up the battery terminals and ground wire connection but they really didn't need it. Still clunk - nothing on the hottest days. I depend on the tractor in the winter to keep our road open so I'm not wanting to screw around. Bought a genuine Mitsubishi factory rebuilt starter and - sure enough - clunk - nothing again. I'm getting a little frustrated by now so tried jumping it with my new truck and still - clunk - nothing. I'm thinking starter drive is not coming out far enough before it engages the flywheel to reliably operate the motor contacts in the solenoid. Put spacer washers between the bellhousing and starter to test my theory and (holy crap!) it works. With some help from the guys at work we made up a spacer out of 1/16 aluminum (looks like a gasket)to fit between the starter and bellhousing - haven't had the problem since. I'm thinking the tolerance on engine to bellhousing was so tight it required a perfect battery and starter to really zing the stater drive out far enough. Maybe I'm missing something but there it is - for what it's worth. If you ever have to split the tractor for anything, I'd make sure the ring gear hasn't shifted on the flywheel. Check also that the flywheel and/or bell housing bolts haven't started to work loose. Alternatively, you may simply not have enough voltage between the keyswitch and the starter solenoid. Thanks guys. I did replace the key switch a couple years ago but that was a case of one day it worked and next day it didn't - no clunk, no nothing. Does make me wonder. I rigged up a momentary toggle and relay to energize the solenoid on an old jeep once. Suppose I could try a relay between key switch and solenoid. The original battery was bad right from the start - wouldn't hold a charge. Was replaced under warranty after it blew acid all over the front of the radiator. I've also replaced the glow plug relay and timer - glow plugs stuck on. Were on for a half hour but didn't seem to hurt anything. Replaced a safety relay when it wouldn't start - pulled the relay and rigged a jumper in the socket until I could replace it. Replaced the other one at the same time out of pricipal. When the seat safety switch fell apart I put a jumper in the wiring connector. Was going to replace it but life is better without it. I'm pretty happy with the tractor but I don't use it comercially and I take it pretty easy. My 2 complaints are you can't climb on past the joystick and you have to unbolt the fuel filter to service it. Suppose I could try a relay between key switch and solenoid. Simple and inexpensive solution, if that's the actual problem. I installed one on my own CUT, attached it right to the starter housing with spiral clamps. But you should perform a simple voltage check to see if that's actually the problem. One man job if you've got long leads with alligator clips, two man job otherwise. Use a digital voltmeter, analog isn't accurate enough. Set it to DC volts, tractor not running. Confirm battery voltage to establish a baseline. Put the (+) lead on the small starter solenoid post where the wire from the keyswitch attaches, (-) lead to ground. Turn keyswitch to START, observe voltage. If you see <10v, consider installing a relay. Less than 8v, definitely install one. If baseline voltage is present, the relay will likely be a waste of time. Good advice - thanks. I know our Asian friends cut $$$ on switches so we'll see if the problem returns next summer. If it does I'll probably do exactly what you're suggesting. My thoughts with the shim was that I could always take it out but it really seems to help. I get a stronger clunk now (just before the motor starts) which I think means the drive shoots out a little farther and faster. One more thing while I'm thinking about it. Seemed like the wire to energize the solenoid was pretty wimpy - 18 gauge maybe. Could replace it with 14 (which is surely overkill) for less voltage drop. That might even explain the hot weather thing. Maybe can use the old wire to pull the new wire back through the harness - doubt it but it's worth a try. Sounds like the same problem that Cub-Cadet CUT owners have had with the Mitsubushi built units; too much voltage drop going from the key, through all the various safety switches until it reaches the starter. Many of us have added a relay. See discussions under the Cub-Cadet posts. Could replace it with 14 (which is surely overkill) for less voltage drop. Not overkill in my book. For my cold start mods (starter/glow plugs/charging), I used 10AWG insulated primary wire. I've posted a link (below) to a DC wire gauge chart, showing maximum amps per length of run for each wire gauge. #10 wire will handle a maximum of 30 amps of 12vdc power for no more than 6.6 feet of run length. #10 wire will handle 25 amps of 12vdc power to a maximum run of 8 feet. #14 wire is limited to a maximum of 15 amps and only to 6 feet. If the run exceeds 6 feet in length, it will be necessary to move up to #12, or even #10 wire. The chart I posted allows for a maximum of 5% voltage drop due to wire resistance. If less than 5% voltage drop is required, it would be necessary to either increase the wire size, or shorten the run length. #10 wire is preferred when wiring 12 volt DC power circuits requiring more than 10 amps of current.